Complete with Dogs...and Cats: Dogs + Cats + Kittens = ? When Elsa Clair and Calvin came to live with us, we already had a full house, animally speaking. With three dogs and two cats already, we were adding two kittens, thus tipping the scale toward a cat-house if you count individuals, but we were way ahead in dog, if you count pounds. So how do you introduce kittens to a group of animals that have already achieved some kind of balance of power? 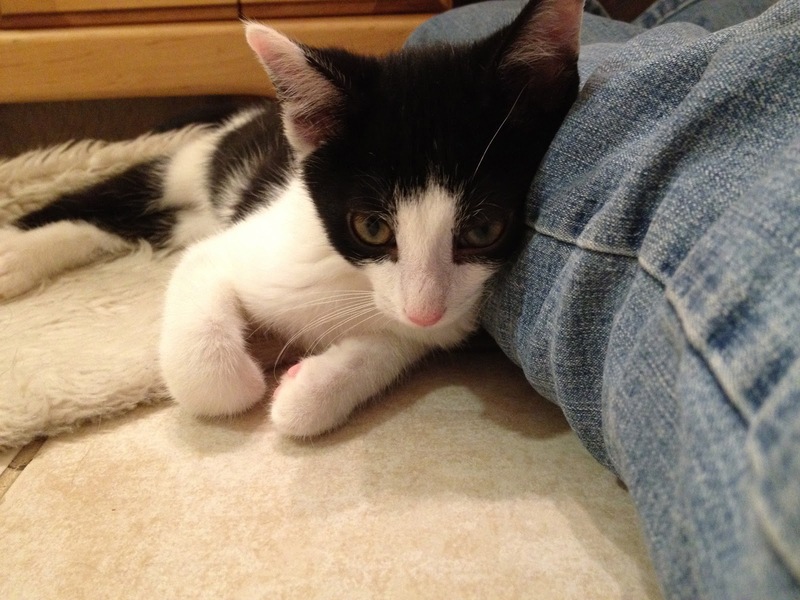 I had introduced kittens to dogs already; I did that when Dawn and Athena joined the family. 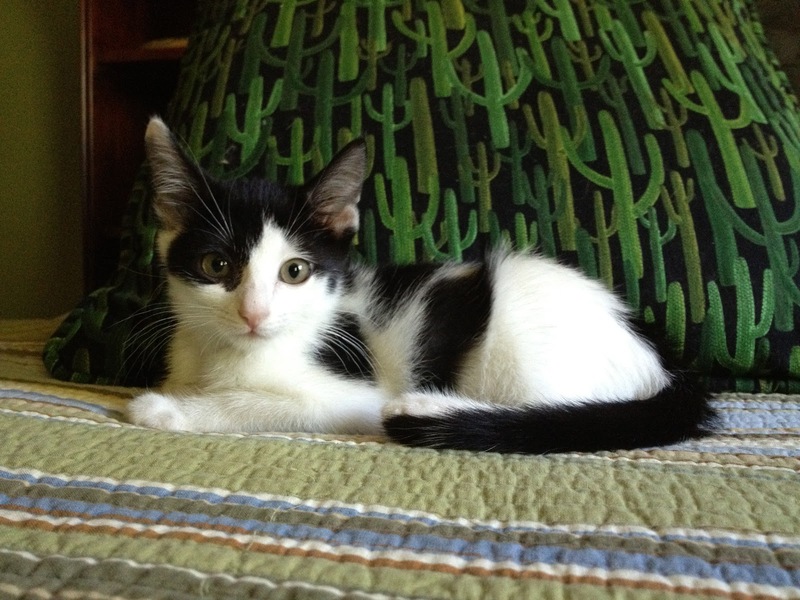 But I was somewhat clueless about how to bring kittens into a home where cats live. It's one thing to read books and Web articles about how to do it--or how others have done it. It's completely different when you're trying to do it yourself. So, armed with as much information as I could gather--including advice from people who live with multiple cats, I took a leap of faith. My hope was that the integration of Elsa Clair and Calvin would go faster than with our first two felines, and that there wouldn't be any lasting damage--to relationships (both human and non), to animals, and to our home. As mentioned in my earlier post, Elsa Clair and Calvin started out living in our main bathroom. All the comforts two little kitties could want were in there: a couple of beds, a small cat climber, water, litter box, a scratcher and some toys. I visited them often, switching their sleeping blankets out so the other animals could get used to kitten smells. But for the first week or so, nobody saw the kittens in the bathroom. They were nothing more than interesting smells and sounds--perceived only through the bathroom door. Calvin and Elsa Clair in their bathroom home. The kittens on one of the interchangeable blankets. Every night, when I brought them their last meal of the day, I spent some serious "just us" time with the kitties. I'd sit on their little drum-shaped cat house, and after they had eaten their fill, the two of them would eventually climb up onto my lap, and snuggle into a purring ball of adorable kittenness. I could have stayed there for hours. It was really special bonding time. Calvin snuggling up to me in his bathroom home. Here's a hint; it's hard to contain kittens. I would say near impossible if they have a mind to bolt. It didn't take the kittens long to realize it was easy enough to zoom out of the room when I opened the door to go in. I solved that problem with a gate in front of the door; I would have to step over the gate to get into the bathroom. It only took a day or so for Calvin and Elsa Clair to figure out that they could climb the gate. Here's something else to note: kittens can fly. I swear it. On several occasions, Elsa Clair zipped up the gate and literally flew over the heads and backs of all three dogs who were always accompanying me to the bathroom where the interesting sniffs and sounds were coming from. The little miss would land on the floor behind the dogs and head off down the hall or into the office, often followed by a giant yet gentle Jasper who could not figure out who or what this creature was. Eventually, the little purr-balls needed to expand their horizons, and once I felt they were comfortable and settled, I began bringing them to other rooms of the house. 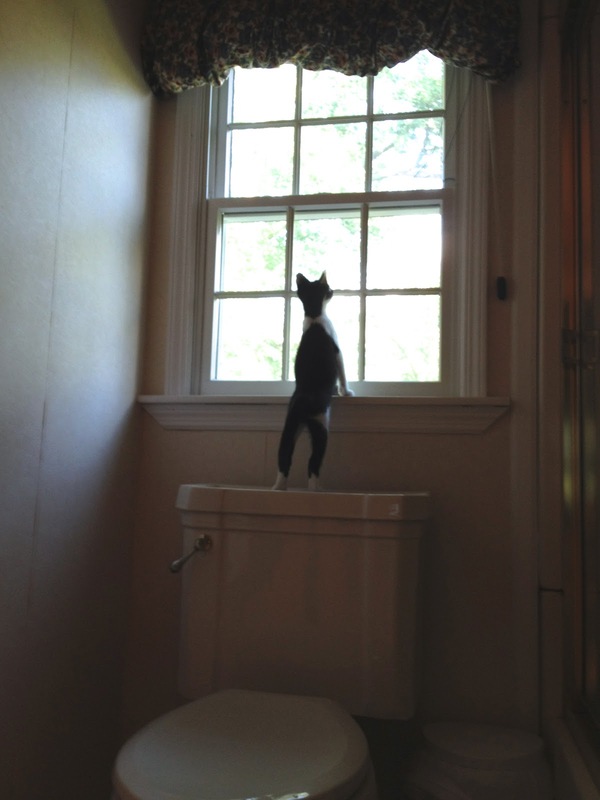 It's a big world out there; Calvin ponders what it's like the Outside the Bathroom. We began in Aaron's room. Away at school, Aaron was informed of this decision as the next step in kitty integration. A cat lover, Aaron was cool with it. Now the kittens could play and explore in a larger room. The kittens played with toys and chased each other around--since they now had more room to run. At first, I kept the door closed. I wanted the animals to be able to see each other but not reach each other. And due to Elsa Clair's ability to fly, I knew gates weren't a good solution. Eventually I devised a system with a screen wedged in the doorway, held in place by old Encylcopedia Brittanicas. (I knew they'd come in handy sometime.) So now everyone could watch everyone. And there was quite a lot of watching going on. Lilah and Dawn watch through the screen as Calvin cautiously approaches. Tucker observes kitty chaos from behind the screen. Dawn and Athena most definitely did not like the new kittens and they registered their complaints with the management. There was hissing and growling and feline grumbling. But the cats could not contain their curiosity and they kept coming back for more. First Elsa Clair, then Calvin figured out how to climb up the bedspread to get to the top of the comfy bed. Here, Elsa relaxes at the summit of Mount Aaronsbed. As is true of all cats, Elsa Clair and Calvin were very helpful while I stayed with them in Aaron's room. Elsa Clair helped work on my computer. Calvin helped with the photography. Elsa Clair dusted the books in the bookcase. Eventually, I replaced the screen with a tall gate. This gave the big cats the opportunity to climb over the gate and come into the room--only allowed when I was there to oversee any interactions. Dawn would supervise from a high vantage point, and hiss if Elsa Clair or Calvin came too close. But she wouldn't leave; she had to keep an eye on these small furry pests who had invaded her home. Once the kittens got used to Aaron's bedroom, I introduced them to another room--the dining room. This was where Athena and Dawn first were exposed to the dogs; with gates placed at both entrances to the room, the kittens were able to safely explore. The cats could come and go as they pleased, but the dogs were kept out. Calvin and Elsa Clair explore the dining room. Lilah and Tucker peer at Calvin through the gate. 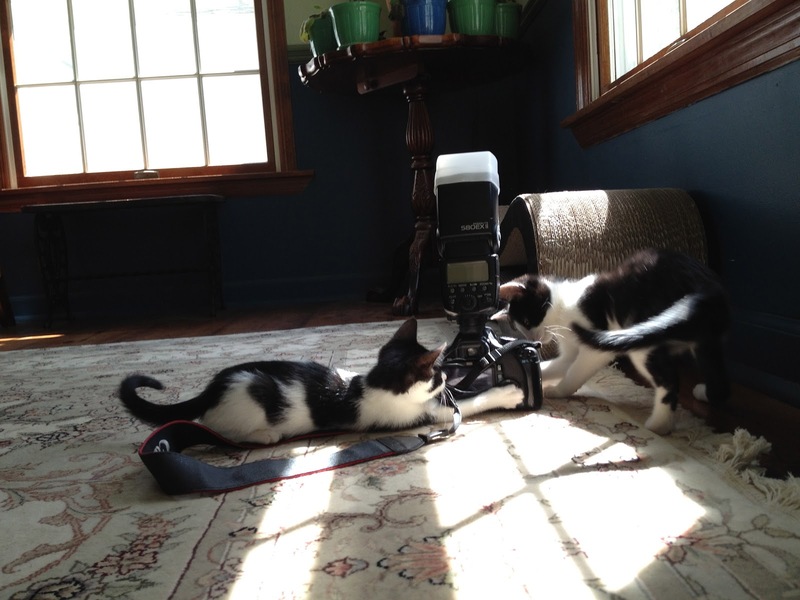 Both kittens are now excellent photographer's assistants. From a precarious perch on the gate, Dawn considers whether she wants to enter the Kitten Room. From the other gate, Athena ponders the same action. Once in the Dining Room of Kittens, Athena is not so sure she likes its current inhabitants. Calvin stays safely out of reach. As the dogs and cats got used to the kittens, I gave them all more and more time to see and sniff each other. The kittens showed no fear of the dogs, which was awesome. I think they were more concerned about the cats. But things were improving every day; the dogs were less tense around the kittens as they got used to their smells. And there were less and less cat growls mixed in with the hisses.